Over the last week, I’ve had the opportunity to immerse myself in the renovation of our school building. 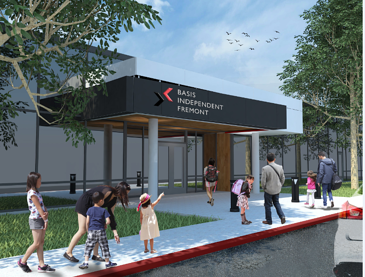 The building that will house BASIS Independent Fremont is a former school, so we’re very lucky that the renovation will be primarily focused on upgrading the elements that already exist in the building. We will also be devoting considerable attention to upgrading outdoor play facilities. Once completed, the building will be a beautiful and functional space that will support the diverse needs of our students, teachers, and staff. I am excited to share with you below a "walk through" of sorts of our school at 3300 Kearney Street. Our lobby will serve several functions. Of course, this is where we welcome students and families into our building. After the building opens, this will be where families meet for tours or special events. Additionally, the lobby allows us to maintain a secure environment for our students. Outside of set arrival and departure times, the external doors are locked and there is a second, internal door that remains locked at all times. The kindergarten year is a special transition period that we aim to support, both academically and in terms of school environment. 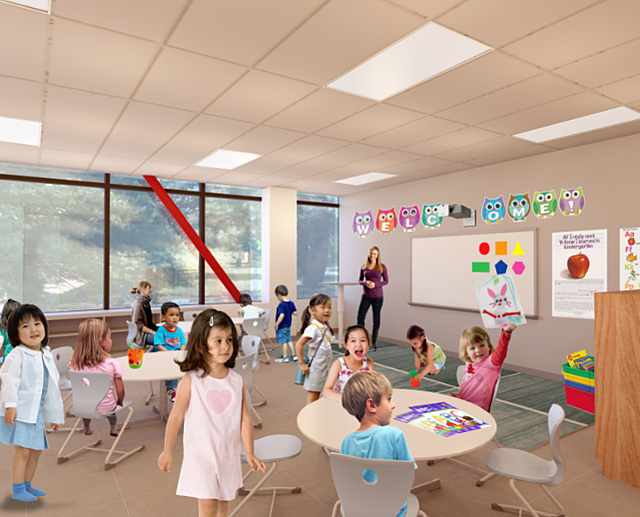 Unlike the older students who will move classrooms during the day, the kindergarten students will spend most of their day (outside of physical education, recess, and certain arts classes) in one room. This consistency provides the students with a familiar, comfortable environment as they transition into primary school. Our kindergarten rooms are open, airy spaces that allow children the room to move around, work collaboratively, and interact with instructional materials. Each kindergarten student will have a cubby in their classroom, where they can store their book bags, lunchboxes, and other belongings. 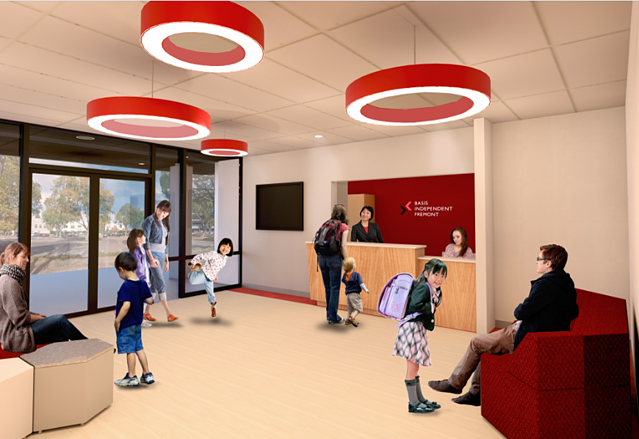 Though not shown in this rendering, there are private bathrooms accessible only through the kindergarten classroom. The multi-purpose room is the heart of our school building. It is a large, centrally located space that will house physical education classes, school assemblies, and community events. We want our students to have the opportunity to run around and play during the day, and the multi-purpose room (when combined with the outdoor spaces) allows just this. 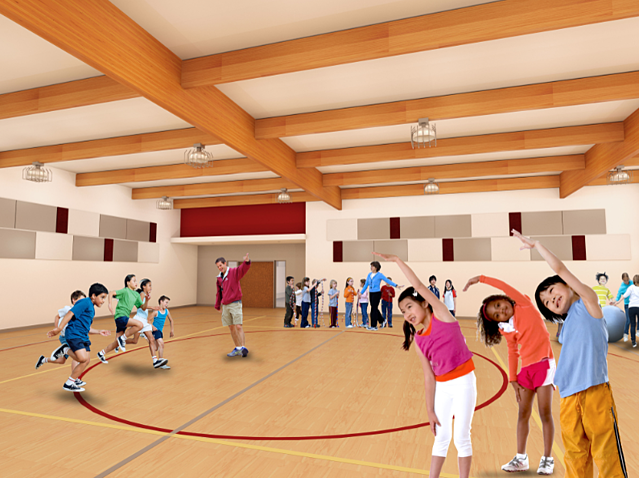 Depending on what the students are exploring in their physical education class, this room might be set up with gymnastics equipment, basketball hoops, or indoor soccer goals. With the exception of the multi-purpose and music rooms, all of our classrooms have large windows that allow natural light to flood into the classroom. 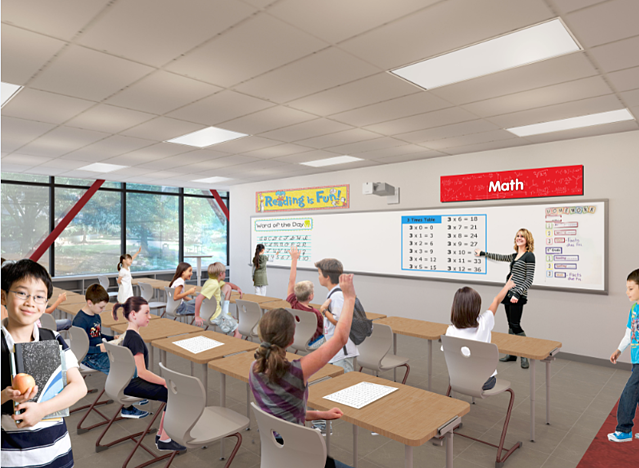 Each classroom is equipped with wireless projectors that allow teachers to utilize a variety of media formats—from PowerPoint slides, to audio recordings, to video footage—during their lessons. Teachers will also have the ability to personalize each room to reflect their area of expertise, as well as the work of their students. More information about our school facilities is available on our website, or join us at an upcoming informational event. Be sure to subscribe to Eureka! Fremont blog updates to receive posts in your inbox. Disclaimer: Images are artist renderings and subject to change.